Marklin H.O. #3471 Swiss/Dutch TEE Class RAm 501 high speed passenger train that ran from Switzerland to Holland from 1957 to 1971. 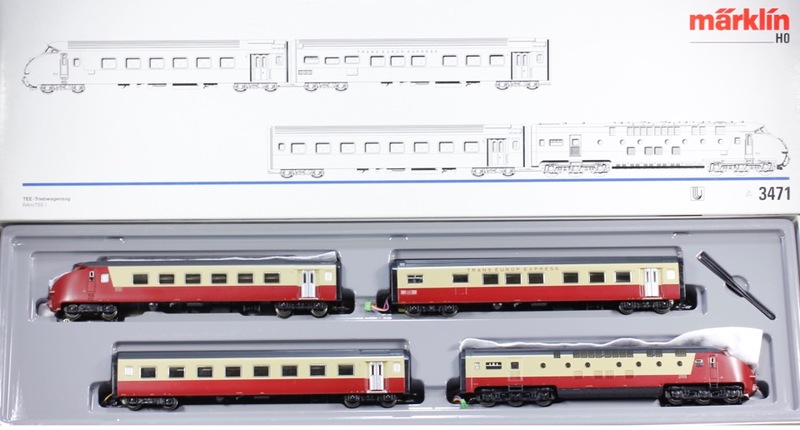 The train was produced for the Marklin 3 rail A.C. Delta / Digital system. The two Passenger cars have full interiors, and interior lighting. The Control car also has a full interior and interior lights. The Locomotive and the Control car have three headlights and two taillights which illuminate based on the train's direction of travel. The set is brand new, and unused. It comes in the original box with all paperwork. This set is a limited run one time issue that was made and sold only in 1995.